Grab a friend and sit under this cool chandelier. Denverspeax, 2015. It’s true – we’ve been holding out on you. Another reason why Denver is the coolest – the annual Chalk Art Festival on Larimer Square a few weekends ago (May 31 – June 1st). Free for all ages, artists gathered and created replicas of photos that were often displayed next to their work in the Square. Photo Credit: Kirsten Ebey, June 2014. Not only were there 200+ artists creating these beautiful works of art, live music, food, and beverage tents were also a part of the festival, much of which supported by Colorado businesses. Many of the artists are local students competing for cash, backed by local businesses. Check back on the Denver Chalk Art website to find out who the winners are. Chalk art, or street painting, dates back to the 16th century in Italy – it’s amazing this tradition is still prevalent all over the world today. Yet another spectacular event in downtown Denver. We love having so many things to do and see downtown – it’s what makes the city great! What Festivals are you looking forward to this summer? Let us know! Follow our adventures on Facebook. Your first question may be, “What is a gastropub?” This type of establishment reflects the warm comforts of your neighborhood bar while still dishing up some delicious, high-end food. At Jonesy’s, the food boasts fun creativity, collecting comfort foods from around the globe and recreating them at an affordable price. Opened in 2008, Jonesy’s focuses on the simple pleasures of relaxing at a local eatery. An insta-comfort zone, Jonesy’s is built with a welcoming atmosphere, supporting the wino and Colorado Craft Beer junky alike; bonus – they ALSO cater to foodies near and far. The menu is anything but foreign- it’s simple to pick out old favorites with a new, funky twist. A speciality of Jonesy’s are their ridiculously addictive fries in several flavors.The header of the fry menu states “Best fries in the US + Best in Denver”; DenverSpeax is here to assure you that they were not fibbing a bit. And, why is that? Oh, because we tried all of them. To get a feel of what we were in for, we began with the Thai Ginger, a plate bursting at the seams with a powerful kick of spice teamed up with a sweet thai chili glaze. After eating one plate of fries, we had to check out what was going on with the rest of the menu. Luckily, we were able to try the other fry flavors via sides with our meals! The Buffalo Fries were to die for; crumbly, blue cheese with mouth-watering buffalo wing sauce smothered over a heap of hot, crispy fries. We loved how the fries were crispy at first, but eventually soaked up the sauce of whichever flavor we tried. There may, or may not have been, an argument regarding whether the first or last bites were the best. By the end of this magical Jonesy’s journey, we were stuffed. Plates of fries, Colorado craft beer, entree’s…. BUT WE COULDN’T STOP. So we did what any sensible person does when they’re over-stuffed and unbuttoning the top button on their jeans, and ordered dessert. Vietnamese ice cream atop a chocolate brownie – a fantastic collaboration of sweet, rich, and indulgent. The Vietnamese ice cream was most definitely the best we had ever tasted, agreeing that this should be a weekly splurge. Oddly enough, the dessert kind of resembled what we loved about the fries – the smothered goodness of flavor, enhancing each fry as they sat and soaked. Stop by and check out Jonesy’s at 400 E 20th Ave in Denver. The environment provides a great outlet to wind down the week. Also, the patio should be opening soon due to this amazing weather we’re having – sit outside, take a load off, and enjoy a brew and some fries! Come get your Tweet on with DenverSpeax! A song comes on the radio, and you’re instantly placed into a time previous of extreme joy, or maybe content, or possibly sadness. You head west out of Denver to visit the Rockies, and you’re reminded of your first trip to Loveland Pass, or your first drive through the Eisenhower Tunnel. View from Arapahoe Basin – Click on the photo to see more beautiful pictures in this area. These places serve as reminder for us as to why we moved here, and why we started DenverSpeax. It’s important to reflect, and have our reflection over the past (almost) year rejuvenate our spirits and provoke motivation. I thought it would be good to pass this along to you all who have supported us. When we moved here, we had a few friends from back home, but they were fairly new as well. It was difficult to find places to go or see because we didn’t know what we were looking for, per se – try using Yelp to find a restaurant when you’re in the mood for a certain atmosphere, or when you’re trying to make friends – is there a filter for those? Although we believe Yelp is a great application and very helpful, sometimes a star-rating just doesn’t cut it. Sure, there’s another great site called TripAdvisor – we use it when we are traveling…but we weren’t traveling any longer. We weren’t looking for advertised Bed & Breakfasts and their ratings – we were looking to call a place home. The best way to learn and begin to understand a community is by fully emerging yourself. 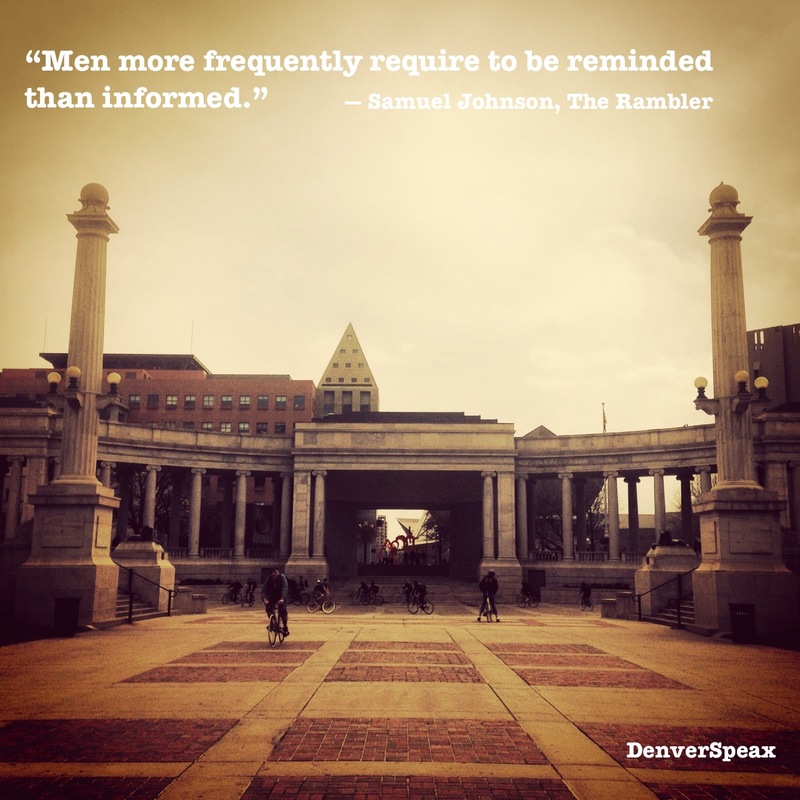 This is what we’ve learned in our various travels domestically and internationally, as well as with this move to Denver. Out of boredom, and lack of known resources within the Denver community & beyond, DenverSpeax was born. City Park hosts City Park Jazz for many Sundays each summer. Click on the picture to read more! We roam around Denver and the surrounding areas looking for what’s good in the community. The good comes in all shapes, sizes, and experiences. We support small, local businesses when we eat out, and prefer to stay local with our purchases as well. Luckily, there are so many festivals, parks, food and beverage, volunteering, and natural beauty here that we’ll never run out of things to write about. Walking around on the 16th Street mall can be a ton of fun. Click on the picture to check out more! DenverSpeax exists to promote positivity within the community, helping out natives and transplants alike with what to do, where to go, and how to experience all of the good that’s so aplenty here. Know someone who’s moving to Denver? Show ’em our website. Ran out of things to do and experience? Look through the site! Planning a trip to Denver and want the real feel of our diverse community? Well, we have a website for that! Volunteering – how can we give back to the community we love so much? There are so many ways – we just need to DO IT. Collaboration with other Colorado start-ups that need support with getting noticed in the community. Visiting Bed & Breakfasts local to Denver so that we can provide our visitors with features on great places to stay. What other features would you like to see on the website? What is local and positive that you just can’t live without? For more on what’s good in Denver, follow us in real-time on Facebook, Instagram (@denverspeax), or Twitter (@denverspeax). Want to attend one of the most-anticipated, coolest Spring festivals happening RIGHT HERE in Denver, Colorado? Picture courtesy of The Denver Flea’s Facebook page – check ’em out and LIKE ‘EM! Check out The Denver Flea 2014 on May 24th, and experience Colorado’s own home-made crafts, food, and craft beer – all brought to you in one beautiful setting: Denver City Park. Look at this gem, courtesy of the DenverSpeax archive! Picture courtesy of The Denver Flea site – click on the pic to check it out! All of the fun kicks off at 2 pm; make sure you view The Denver Flea website for additional information, including a full list of vendors, food trucks, and craft brews available MAY 1st, 2014.